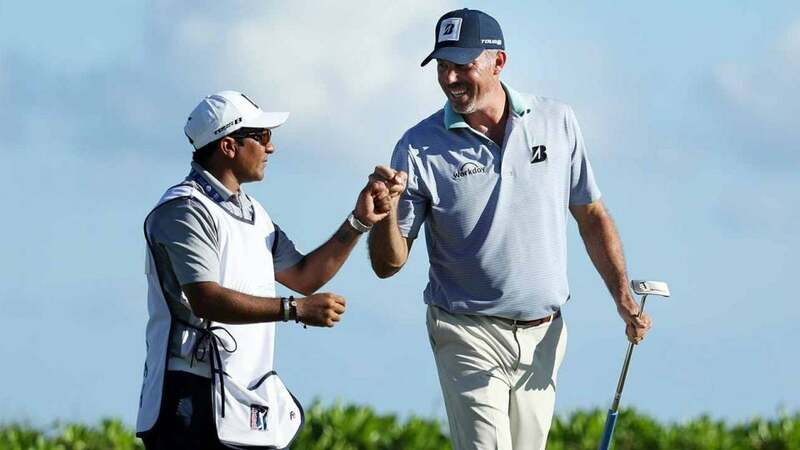 Matt Kuchar and his local caddie, David, teamed up to win in Mexico. A man known as "El Tucan" just got paid. Matt Kuchar shot 69 on Sunday to win the Mayakoba Golf Classic by one over Danny Lee and claim his first victory since April 2014, and he did so with a local caddie named David. Kuchar committed to the event late, and his regular caddie, John Wood, had a prior engagement already scheduled. So Kuchar reached out to a few other caddies he knew, but none were able to help him out. His last option was to talk with tournament director Joe Mazzeo, who paired Kuchar with a local looper named David, although he's most known in the area as "El Tucan." "It's been good," Kuchar said on Friday. Coincidentally, Kuchar's wife, Sybi, filled in on Zach Johnson's bag on Thursday. "I think both of us are pretty easygoing. It's been quite easy. He's a steady rock out there and it's been fun to have a local, some guy who can kind of point me in the right direction and who knows the ropes around here. I've enjoyed it." El Tucan has been on a roll lately. He caddied for Mexican pro Armando Favela in the Mayakoba qualifier at El Camaleon a couple of weeks ago, and Favela won a playoff to get into the field (and finished T16). Kuchar said local caddies have brought him good fortune before. He won the 2015 Bridgestone America's Golf Cup, an unofficial event, with a local looper. "[El Tucan is] definitely my lucky charm," Kuchar said on Sunday night. "It was great having him with me. I feel like he brought me good luck, some extra crowd support, and did a great job as well. So he was great on the bag. Did just what I kind of was looking for and hoping for." Kuchar won $1.296 million with the victory, and typical player-caddie arrangements hand loopers five to 10 percent of winnings, and usually 10 percent for a win (not counting a weekly salary). So while we'll never know the exact arrangement Kuchar and David had for the Mayakoba, it's safe to say El Tucan had a lucrative week as well. As for Wood? Kuchar said he was likely flying to Australia when he won on Sunday night. Wood and Kuchar reunite at next week's Australian Open. "I'm sure John's disappointed not to have worked this week," Kuchar said. "He's a great caddie, John does a fantastic job. I look forward to getting back with him next week, but I'm excited for El Tucan; sorry for John."